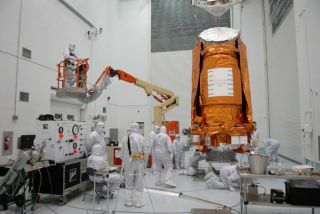 If Friday?slaunch goes according to plan and successfully lobs NASA?s new Kepler spacetelescope into orbit, the mission stands to potentially change the way we lookat the universe. Kepler isdesigned to turn its eye on thousands of stars in our own Milky Way galaxy andlook for signsof Earth-sized planets orbiting in a region conducive to supporting life. "Keplerwill push back the boundaries of the unknown in our patch of the Milky Waygalaxy, and its discoveries may fundamentally alter humanity's view of itself,"said Jon Morse, director of NASA's Astrophysics Division at the agency?s headquartersin Washington, D.C. The probeis slatedto launch on Friday from Cape Canaveral Air Force Station in Florida aboard a Delta 2 booster. NASA delayed the mission by one day for extra rocketchecks after the loss of another probe just after its launch last week. The $600 millionKepler mission is named for Johannes Kepler, the 17th century German scientistwho pioneered the fields of optics and planetary motion. "Now,400 years later, we're using his discoveries in order to answer a profound andfundamental question about our place in the universe: Are there otherEarth-like planets out there?" Morse said. Kepler willuse an unprecedented combination of light detectors (adding up to about 95million pixels) to capture the subtle shifts in light that characterize an extrasolarplanet orbiting its star. For comparison, a high-end digital camera onEarth might have 10 megapixels, but Kepler?s detectors add up to 95-megapixelarray, mission researchers said. Over thelast two decades, scientists have spotted more than 300 extrasolar planetscircling other stars in our Milky Way galaxy. Most of these planets have beenabout the size of Jupiter or larger, making it unlikely they would harbor life.But those aren't what Kepler is aiming to find. "We'reinterested in planets likethat of Earth, rocky planets in an orbit where life might be possible,"said principal investigator for Kepler science William Borucki of NASA's Ames Research Center in Moffett Field, Calif.
Kepler willbe pointing its 0.95-meter diameter telescope and array of 42 charge-coupleddevices (light-sensitive microchips also found in standard digital cameras) ata pre-selected target group of 100,000 stars. Kepler willbe looking for fluctuations in the light of each star that result from a planettransiting ? or moving in front of ? its parent star as seen from theperspective of Earth. These fluctuations can tell scientists how big the planetis, as well as how far away its orbit is from its parent star. "Whena planet goes across a star, it blocks some light," Borucki explained. "The bigger the planet, the more light it blocks, so we get the size ofthe planet from the size of the dimming." By lookingfor multiple transits, the Kepler team can determine the planet's orbitalperiod, or how long it takes the planet to circle its star. Each planet willneed to be observed through at least three transits, Borucki said, to determinethe period and to make sure the dimming isn't due to some other astronomicalphenomenon, such as a spot on the star. "Wedon't want to have false discoveries; we want to be very, very sure that whenwe say it's an Earth, it really is an Earth," Borucki said. If thepotential planet has a short orbital period (a few days or weeks), that meansit orbits very closely to its sun. A long period (of several years) would meanit sits closer to the edge of the star's gravitational grip. In general, suchextreme orbits would make the planet too hot or too cold, respectively, forlife to arise there. Borucki andthe rest of the Kepler team are interested in finding a planet with a moremiddle-of-the-road orbit, one that is "not too hot, not too cold, but justright," he said. Such orbits, which fall in what is called the sun's"habitablezone," would mean that the temperature of the planet was mild enoughfor liquid water to exist on the surface. Of course,this Goldilocks orbit won't be in the same place for every star, which can havelarge variations in the amount of light they put out. Kepler willbe looking at three main types of stars: A-type stars, G-type stars (the groupour sun belongs to), and M-dwarfs. A-typestars are the hottest of the bunch, which shifts their habitable zone furtheraway from the star. They "arevery luminous, they put out a lot of energy, and their habitable zone isactually much further away from the star than for our Sun," saidastronomer Debra Fischer of the San Francisco State University, who is notdirectly involved with the Kepler mission. Thehabitable zone for G-type stars would lie in the range of Earth's orbit, so anylikely exoplanet candidateswould have an orbital period of about one year. M-dwarfs,meanwhile, lie on the other extreme. "Thesevery low luminosity stars are not giving out as much energy," Fischerexplained. "To be in the habitable zone around one of these low-massstars, you have to move in a little bit so you can warm up, basked in thestarlight." So planetsin the habitable zone of an M-dwarf will have much faster orbital periods thanthose in the habitable zones of G-type or A-type stars. "Andso what Kepler will be doing is watching as the planet goes across, blinks thestarlight out, and with the M-dwarfs, the frequency of the blinks of planets inthe habitable zone is going to be much higher," Fischer explained. Keplerwon't be sending back news of a twin Earth right away though. Once it is up inorbit and properly calibrated, it will likely churn out detections of biggerplanets first. The firstplanets to "roll out the Kepler assembly line" will likely be theso-called 'hotJupiters,' Fischer said. The planets are intriguing to astronomers becausethey are the size of Jupiter but sit at the orbit of Mercury. "Theshear number of these objects that Kepler will find is going to help us learn alot about these systems," Fischer said. Next toroll out will likely be the similarly-named 'hot Neptunes," and thenfinally, "the hardest detection, and by far the most exciting, is going tobe the detection of bonafide Earths," Fischer said. WhileKepler won't be able to tell astronomers what the planets look like, Fischerthinks there will be great variety in the otherpotential Earths out there, for example, 'water worlds' covered entirely byoceans. "Ithink that the science fiction writers are going to be challenged to imaginethe diversity that we could expect to find even in these types of planets,"she said. Just howmany other Earth's Kepler will find is anybody's guess though. "because wedon't really know what's out there," Borucki said. "Kepler'sdesigned to find hundreds of Earth-size planets if such planets are commonaround stars; dozens of these planets if they're in the habitable zone,"Borucki said. "If we find that many, it certainly will mean that life maywell be common throughout our galaxy, because it's an opportunity for life tohave a place to evolve." "If onthe other hand, we don't find any, that will be another profound discovery. Itwill mean that Earths must very rare, we may be the only extant life in ouruniverse," Borucki added. "It'll mean no 'Star Trek.'" Boruckiemphasized that no matter what Kepler finds, it won't find little green men. "AlthoughKepler will not find E.T., it's helping to find E.T. 's home," he said.